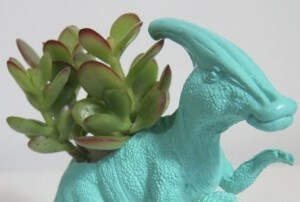 Crazy and colourful succulent planters made from old plastic toys by Plaid Pigeon. Plaid Pigeon are quirky Texan duo Megan Briggs and Ian Mailhot. These guys have found their design niche in succulents and cacti pots and terrariums. Check out their range of interesting planter pots on their Facebook page.